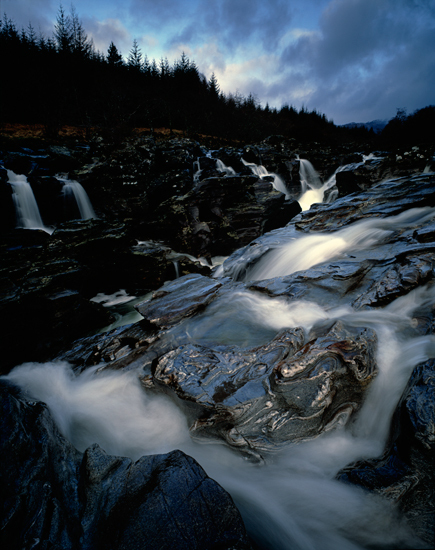 This image was taken at Glen Orchy in the Scottish Highlands. It is at a spot surrounded by trees where a gorge has formed into the riverbed, creating a dock fed by water flowing over and among the rocks. I had wanted to make an image of this gorge for a long time and I’d tried at various times of the day in different weather conditions, but always failed. However, it just so happened that on this particular day everything came together. Shot in January in the early afternoon, it was about an hour or so before sunset so it was getting reasonably late in the day. The sky was really moody and the level of the river was just about right – sometimes you can’t get across to those rocks in the middle because it’s just too fast-flowing. Yet with the river being low, it meant that I could creep across to the centre and make a picture. It’s usually quite tricky to get out to that point. I sometimes take groups there to photograph, but I tell them they can’t walk out on the rocks in case they fall in. On this occasion, though, I was on my own and it didn’t matter if I fell in! I love the swirly patterns in the metamorphic rocks. I find them really interesting and it’s what drew me to photograph the scene. The whole landscape has a very primeval feel – it has an air of legend, and that’s what I wanted to try to convey in the photograph. The image was shot using a 5x4in Linhof Technikardan film camera, using Fujichrome Velvia 50 film. I wanted to show the movement of the water to create a mythical feel, so I probably shot it with an exposure of 4-8secs with the lens stopped down quite a way, at around f/22-33. I say probably, because just after I took the picture I dropped part of the camera back into the water, so I was distracted afterwards and did not note down the settings I used! I managed to fish the camera back out, but had to put my arm up to my shoulder in water that was only just above freezing. Fortunately, the back was fine after it had dried out! Many people make the mistake of thinking that this image was shot with the addition of artificial light, as it looks like the front rock is in a pool of light, but it’s actually not. It’s all shot using available light and there are a couple of reasons for it looking as it does. First, I used a very wide lens – 72mm – for a 5×4 camera, and this type of lens on a large-format camera creates what is known as a ‘hotspot’ in the middle of the image. As a result, the picture will be bright in the middle, with the light then falling off towards to edge of the frame. This is just an artefact of the lens. You can buy a centre-spot filter to correct this, but I’ve always liked the effect it produces. It works really well for this particular scene, because if you’ve got a subject that has something like at rock in the centre of the image, that will be the exposure my light meter has told me to take, and everything else will be slightly darker around it. I think this all adds to the mood of the image. Second, the image benefits from the addition of a 21⁄2-stop graduated filter over the sky, to darken it slightly. I like darkness because it’s emotive and it adds to the overall mood of the image. I did a minimal amount of post-processing to the scan, merely enough to make the file look like the transparency. This is a photograph that I like very much, as I love the flow of energy through it. I like the way the water predominantly runs from right to left across the image and falls down towards the bottom left-hand corner, but in contrast the direction of the sky and the energy within it is going in the opposite direction towards the top-right corner. I like that contradiction. I wanted to make the image feel slightly mythical and I think I’ve succeeded in that because there’s a darkness within it that I like. I feel that too often in landscape photography people try to show every single detail, and it’s often what you miss out that can leave room for the viewer to bring their own story to the picture.